ST. PETERSBURG, Fla. (April 5, 2019) -- Tampa Bay Rowdies fans with ESPN+ subscriptions to watch Rowdies matches are about to get even more value from the platform as U.S. Soccer and ESPN+ have reached an exclusive, multi-year media rights agreement to stream all Lamar Hunt U.S. Open Cup matches on the platform. The U.S. Open Cup is the longest-running domestic cup competition in the United States. 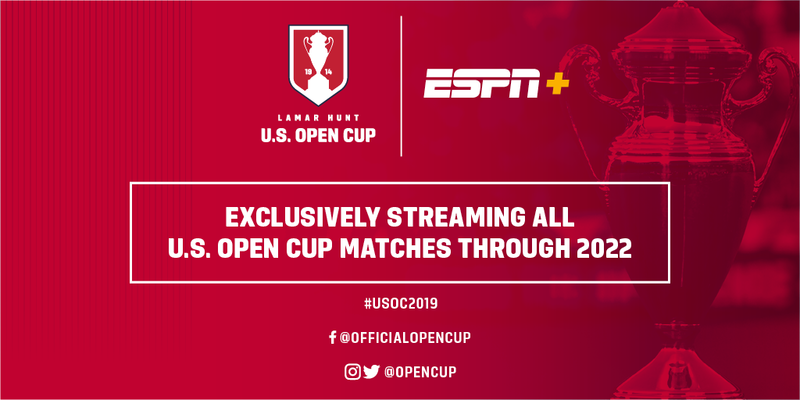 All matches from the First Round through the Final will stream on ESPN+, the same platform that streams the Rowdies USL Championship matches. Tampa Bay will enter the competition, along with 24 other domestic Championship sides, in the Second Round on May 14-15. Major League Soccer teams enter in the Fourth Round on June 12. The Rowdies best Open Cup run came in 2013, when the team beat VSI Tampa Bay FC and then the reigning champion Seattle Sounders at Al Lang Stadium before being eliminated by the Portland Timbers.